Here's another irony. 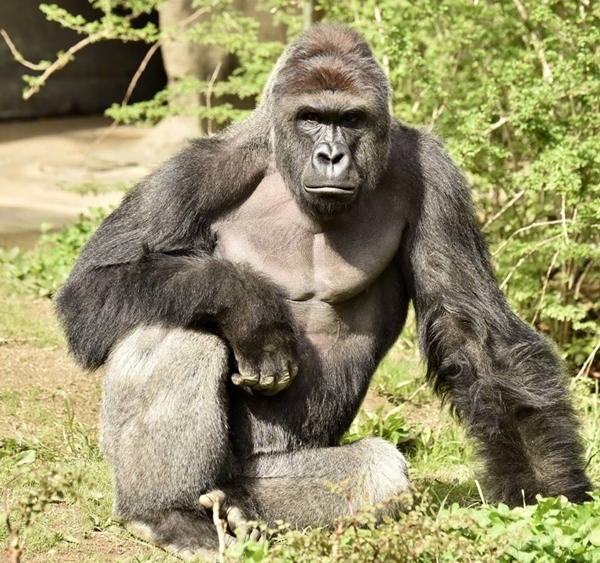 Only one week ago, we might have not heard of Harambe while he was still alive but now that he is dead, his Swahili name full of fortitude and noble grace has come booming centrestage as a rallying cry from behind the locked Gorilla World enclosure of Cincinnati Zoo - the second oldest zoo in the US - as a painful reminder of our human failings. Such a tragedy is imputable to us in our tampering with the natural order, with the laws of nature. It's all about control with us. Yet animals do not belong in zoos or circuses. As the manipulators and controllers of nature - that we never leave alone to sort itself out - we humans have thrown it out of whack. Today we are faced with a shrinking wildlife count, the looting of our natural resources by Big Corporate (TransCanada anyone? ), pollution at every corner of the globe and a galoping worldwide population whose consumerist needs and fads cannot be sustained. Here the laws of nature had been flawed from before Harambe had even been conceived. 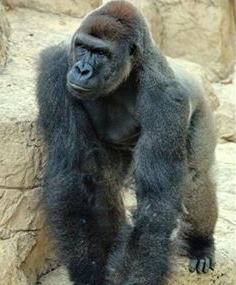 The magnificent Western lowland silverback male gorilla, part of a critically-endangered species (traditionally found in the dense Central African rainforests), was born in captivity (at the Gladys Porter Zoo) on 27th May 1999 and relocated to Cincinnati Zoo in September 2014 in order to fulfill the gene pool and as a star attraction in his own right that got the zoo a bang for its buck in the entertainment stakes. Then last Saturday, an unsupervised 4-year-old kid intent on getting close and personal with the young primate, fell into the exhibit moat at Gorilla World. By that point, the writing was on the wall, bearing Harambe's name. The inquisitive gentle gorilla, described as 'very intelligent and curious' by the zoo itself, dragged the kid out of harm's way (see video footage). Harambe wasn't acting out of sorts or displaying any animosity towards him. Yet the keepers didn't take any chances, because as much as zoos are artificial environments, we are still dealing with wild animals forcefully confined into unnatural habitats. And in a country where litigation and media are trigger-happy, so had to be the next course of action. Except this was anything but happy. Taking a chance with an inquisitive wild animal was not on the agenda, so the zoo’s own SWAT Team, the Dangerous Animal Response Team, was dispatched over and put control back into the controlled environment of the zoo: they shot Harambe dead. It was, as The Conversation noted, a lose-lose situation that claimed the life of a gorilla pottering about minding his own business, a curious kid who soon enough will realise the consequences of his decision, and the keeper who ruled out tranquilizer shots, and instead took the great ape's life. No doubt will that guy be forever haunted by his decision, despite it being for the kid's best interest. There is no happy ending to the story and no winner. Just one hapless chain of events triggered by an unsupervised kid (where were the parents?!) that spelt disaster along the way, not only to Harambe, but to the other gorillas, his former caretaker, the zoo staff, the kid's family, the local community, conservationists (Dr. Jane Goodall), animal lovers, and the animal kingdom at large. Hereby we have witnessed yet another failed experiment of human foray into wildlife, snatching it from the wild, parking it into zoos for breeding programmes and boosting the balance sheets, and making spectacles out of jailed animals plucked out of their natural habitats for our eyes only. 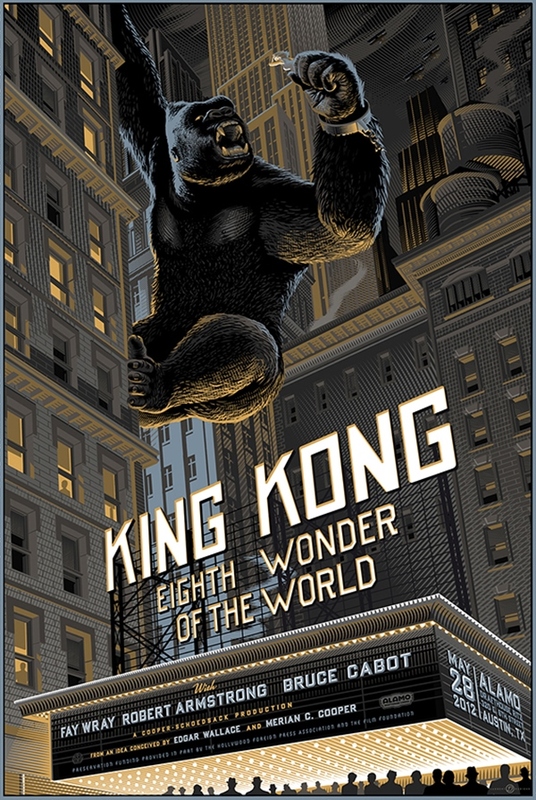 King Kong (1933), movie poster revisited by graphic artist Laurent Durieux, commissioned by Mondo. "Surely we can begin to agree that animals which share 98 per cent of our DNA should not be kept as entertainment for us to gawk at in a zoo." - Mimi Bekhechi, PETA UK Director, via The Independent. Please join me in signing the Justice for Harambe petition.